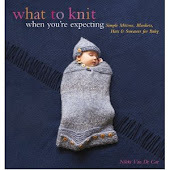 What To Knit When You're Expecting: Tired of Baby Knits? Here's one for the grownups. 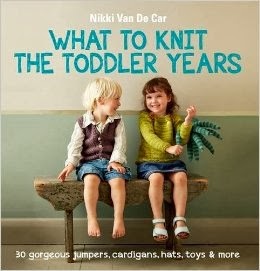 And if you're not tired, have no fear--it'll be pretty much all baby knitting all the time from here on out. Originally intended for me, this bolero tried my designing patience to the point where it had to go live with someone else. It just wouldn't do what I wanted it to do. The linen stitch (originally meant to flare because I didn't quite conceive how much linen stitch cramps up like a crazy, grasping, greedy old man) tucks nicely against the ribcage, while the stockinette billows over it slightly. It's very sleek, but the blindingly bright color makes it fun. On Mary. Because I still have not forgiven it. Anyway, it looks nice on her. The sleeves do manage to flare slightly, and the linen stitch accents the edgings of the neckline, cuffs, and buttonband (which should be called something else, since there's just the one button and it doesn't even sit on the buttonband, but there you are). I was originally going to post this pattern--because my hatred for the thing notwithstanding, I do think it is quite nice--but in looking over them, my notes are far to scribbly and probably not even accurate really, considering how many times I had to rip back and try again and still not achieve what I was going for. And I'm so not going to knit the thing again. I could probably cobble together a vague recipe if anybody's really interested--send me a note. And for anybody scratching their heads over the very grownupness of these shots as compared to most of the photos that appear on this blog--I didn't take them, and neither did Dave. Mary's girlfriend Sara Fuller actually knows what she is doing and does this kind of thing for money and stuff, and I begged them to take these for me (Mary's obviously not very happy about this arrangement, but she's holding up her end of the bargain nonetheless). Appreciation: 1) first picture, which is gorgeous and made me wonder why you weren't doing a photo blog. Go Sara Fuller! 2) your description of the linen stitch. Really made a foreign concept come alive for me.